To best understand the patterns we discern in the landscape, it is helpful to know something of the history of a place. Nomadic Native Americans occupied the present-day area of the park at various times before the coming of European settlers. Eastern Algonquian-speaking people established semi-permanent settlements in the Rock Creek area.1 Evidence suggests they burned the forests to create open areas to facilitate travel, prepare land for agriculture, and improve the habitat and food sources for the animals they hunted. This probably resulted in areas of open forests dominated by trees such as chestnut oak and other oaks able to survive repeated fires. Steep slopes with rock outcrops made agricultural development in the Rock Creek valley unfeasible. Ruins of a historic mill on Rock Creek (in foreground). Photographer: Gary FlemingThe Peirce family also built a gristmill on Rock Creek, which operated from the 1820s to 1897. It was one of at least eight mills along Rock Creek in the Washington, D.C. area in the 1800s, most of which shut down before 1900. 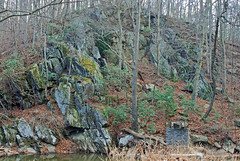 A rocky dam several hundred yards upstream of Peirce mill directed water into a trench called a millrace, where the rushing water turned the mill’s waterwheel. A decorative dam was added at Peirce Mill in 1903, after the mill had shut down. Dams like this prevented spawning fish from swimming upstream in the spring. Today, a fish ladder allows fish to swim past this dam—see Rock Creek Fish Passage in Current Water and Land Use and watch a video about Rock Creek Fish Ladder. Fort Stevens as it was during the Civil War. It is located just east of Rock Creek, part of today's Fort Circle Parks. Photo courtesy of the Library of CongressIn the 1860s, 68 forts, 93 batteries, and 20 miles of trenches were built to encircle the nation’s capital. In the immediate vicinity of Rock Creek, 16 forts occupied prominent hills including Fort DeRussey, right beside the Rock Creek valley.7 Ecobit: Ridgetop River Terrace Riddle tells an interesting story about the geology of the hilltops some forts were built on. War-time innovations introduced permanent changes in areas that would become Rock Creek Park. On some hillsides, the more nutrient-rich and biologically active layer of topsoil was lost in the construction of infantry trenches that protected the forts. While forests have since grown back in the remaining poor soil at Fort DeRussey and other Civil War fortifications, they are much altered from the forests that stood there before the 1860s. Perhaps equally significantly, the creation of Military Road increased the opportunity for development and commerce within and west of the Rock Creek valley, leading to more traffic through the valley. 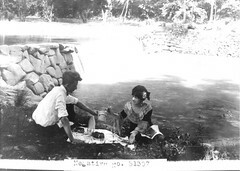 A couple enjoying Rock Creek's banks in the 1910s, beside a decorative dam. Photo courtesy of the Library of CongressDuring and after the Civil War, the population of Washington, D.C. skyrocketed, as did the need for housing. 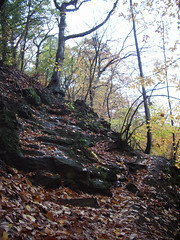 Rock Creek valley’s remaining forests south of Military Road were fortunate to survive relatively unscathed, primarily because the steep terrain made development expensive and difficult. Instead, as conditions in the capital became increasingly crowded and unhealthy, more and more people sought out the natural beauty of Rock Creek as a place for reflection and restoration. President Lincoln and many subsequent presidents sought out the forest oasis as a retreat from Capitol Hill. In 1890, because of public reverence for its beauty, the Rock Creek valley in the District of Columbia north of the National Zoo was officially set aside as protected land. At that time, the landscape was a mosaic of clearings and forest patches. Clearings were the result of farming, war, and fire (natural and introduced). Rock Creek Park in Washington, D.C., including other parcels administered by Rock Creek Park, for a total of about 2,800 acres.Since its establishment, Rock Creek Park’s jurisdiction has expanded to include the Rock Creek and Potomac Parkway (lower Rock Creek—the southerly stretch between the National Zoological Park and the Potomac River), and to include tributary stream valleys that feed into Rock Creek. 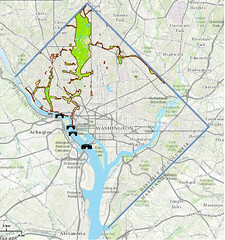 Other pieces of property, though not naturally connected to the Rock Creek valley, have also been added to the jurisdiction of Rock Creek Park, including the grounds of former private estates (such as Glover-Archbold Park and Dumbarton Oaks Park), historic Civil War fortifications (the Fort Circle Parks), and highly designed cultural landscapes. Well over a century since its founding, what do we see now in the landscape at Rock Creek Park? Since the abandonment of forts and fields, and the suppression of fire, the forests have returned. Today, 85 percent of Rock Creek Park is forested again. However, in areas where the most severe or recent soil and/or vegetation disturbance occurred, Rock Creek’s forest communities are still recovering. Soils are a major predictor of the type of natural community at a site, and once the important topsoils have been lost (due to erosion, or earthmoving during the construction of earthen fortifications, for instance), the recovery of the soils and the natural communities they supported is an extremely long process—more than several hundred years in some cases. Not surprisingly, many forest communities in areas of the park known to have been cleared before or during the Civil War—especially between Military Road and Wise Road—have characteristics of semi-natural (or successional) communities. With time, natural processes may help them regain more soil microorganisms and better soil structure that help support healthy natural communities. 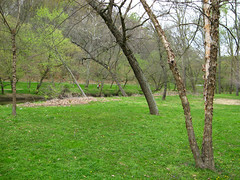 Mowed picnic area along Rock Creek. Photographer: Erin Lunsford Jones, courtesy of NatureServeSome green areas at Rock Creek Park are designed or being maintained by landscapers. Lawns, shady mowed picnic areas, and planted areas are examples. Non-forested areas at the park nearly all fall into this category. The National Park Service maintains some areas as open meadows for wildlife, and others as places of recreation. Map tip: To find these kinds of non-forested green areas at Rock Creek Park, go to the interactive map of Rock Creek Park and search for "open space" or "meadow." 1. National Park Service. 2016. Native Peoples of Washington, DC. 2. Fleming GP. 2007. Ecological communities of the Potomac Gorge in Virginia: composition, floristics, and environmental dynamics. 4. Bushong W. 1990. Historic resource study. 5. Spilsbury G. 2003. Rock Creek Park. 6. National Park Service. 2009. Civil War Defenses of Washington: Natural History and Physical Setting. 7. National Park Service. 2009. 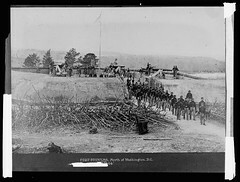 Civil War Defenses of Washington: History and Culture.